From World Class attractions, to home grown festivals, Michigan’s capital region has something for everyone including the one and only LaFontaine Chrysler Dodge Jeep Ram & FIAT of Lansing dealership. 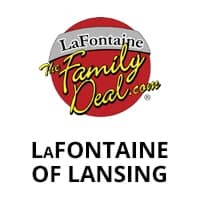 LaFontaine Chrysler Dodge Jeep Ram & FIAT of Lansing lives by the mission statement to “Build lifelong relationships that connect families, strengthening communities and personalize the automotive experience”. We offer a huge selection of new and used vehicles from which to choose. Come see us for, Chrysler 300, Chrysler Pacifica, Dodge Challenger, Dodge Charger, Dodge Dart, Dodge Durango, Dodge Grand Caravan, Dodge Journey, Jeep Cherokee, Jeep Compass, Jeep Grand Cherokee, Jeep Renegade, Jeep Wrangler, Jeep Wrangler JK, RAM 1500, RAM 2500, RAM 3500, RAM Chassis Cab, RAM ProMaster,RAM ProMaster City, FIAT 124 Spider, FIAT 500, FIAT 500L, and FIAT 500x. The LaFontaine Automotive Group has vehicle on staff specialist who can help you find the correct vehicle for your needs and wants. Not only does LaFontaine have vehicle specialist for all the inventory on the lot, LaFontaine has well trained service staff to provide the highest levels of customer satisfaction. LaFontaine also offers four full service, direct repair Body Shops to provide all of their customers in Oakland County, Wayne County, Livingston & Washtenaw Counties with top-notch collision repairs and services. The locations include; Fenton Collision Center, Highland Collision Center, Lansing Collision Center or Ypsilanti Collision Center. The award winning and nationally recognized LaFontaine Automotive Group was founded in 1980. The LaFontaine Automotive group includes 34 Franchises in 15 locations. The LaFontaine commitment to customers, staff, and local communities is demonstrated by active participation and contributions to numerous non-profit organizations, educational institutions and charities throughout southeast Michigan. The combination of both the mission and core values provides the basic foundation of our promise to you… To treat every customers like they are members of our family. Ready for a test drive? Visit our LaFontaine Chrysler Dodge Jeep RAM FIAT of Lansing, MI today.